Geneva, 24 November 2015: The countdown to next year’s World Wildlife Day (WWD) kicks off today, 100 day before 3 March 2016. This special day in the UN calendar, proclaimed by the UN General Assembly in 2013, will be celebrated in 2016 under the theme “The future of wildlife is in our hands”. African and Asian elephants will be a main focus of the Day under the theme “The future of elephants is in our hands”. Countries around the world are encouraged to highlight species from their own countries, both wild animals and plants, adapting the global theme to suit. The theme “The future of wildlife is in our hands” reinforces the inextricable link between wildlife, people and sustainable development. It is the responsibility of each generation to safeguard wildlife for the following generation. It also imparts the pressing need for national action to ensure the survival in the wild of both charismatic and lesser known species. The levels of killings of elephants in Africa and trafficking in their ivory remain alarmingly high. In the meantime, the long term challenges that are facing African elephants are also affecting Asian elephants, namely habitat loss and fragmentation and human-wildlife conflict. More recently, growing levels of poaching has also been witnessed for Asian elephants. “World Wildlife Day 2016 follows the adoption of the historic UN General Assembly resolution on “Tackling illicit trafficking in wildlife” and the new global Sustainable Development Goals (SDGs), with a vision for the planet in which humanity lives in harmony with nature” said CITES Secretary-General, Mr. John E. Scanlon. “The actions each one of us takes, whoever we are, wherever we are, will determine the fate of wild animals and plants. 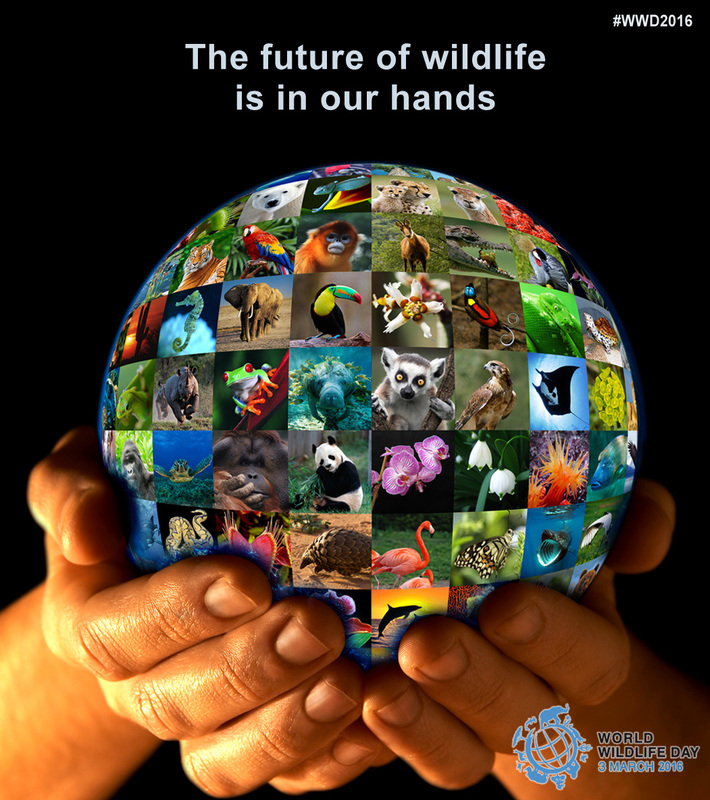 The future of the world’s wildlife is in our hands. Please join with us on this special day in the UN calendar to show your support for wildlife” added Scanlon. The UN General Assembly requested the CITES Secretariat, in collaboration with relevant organizations of the United Nations system, to facilitate the implementation of World Wildlife Day. The CITES Secretariat will continue to work with UNDP, UNODC, UNEP and other international and national organizations to mobilize the worldwide celebration of the day in 2016. In line with the UN General Assembly resolution, the CITES Secretariat reaches out to all member States and organizations of the United Nations system and other global, regional and sub-regional organizations, non-governmental organizations and all interested individuals, to: observe and raise awareness of theme for WWD2016 in an appropriate manner; to associate WWD celebrations to major national and international conservation events, where appropriate; to organize campaigns to reduce the demand for illegal wildlife and their products using targeted strategies in order to influence consumer behavior; and to make use of the WWD logo as widely as possible. The WWD logo remains the same as for 2014 and 2015 and it is available, and free to use, in the six UN languages from the WWD website. Graphic materials to illustrate the theme will be made available at a later stage. The theme of WWD2016 was adopted by a Working Group established under the CITES Standing Committee on WWD which comprises representatives from State Parties to CITES, UN system organizations and leading international and national conservation organizations. Hashtag for WWD 2016 is #WWD2016. With 181 Parties, Convention on International Trade in Endangered Species of Wild Fauna and Flora (CITES) remains one of the world's most powerful tools for wildlife conservation through the regulation of trade. Thousands of species are internationally traded and used by people in their daily lives for food, health care, housing, tourist souvenirs, cosmetics or fashion.